« Can Precious Metals & US Treasury Bonds Fall Together? Imagine the price of gold jumping to $1,500 overnight… what would that do to the price of junior mining companies? That’s what just happened to the price of coal - it jumped 38% in one day! Coal is dirty, it’s dusty, and it sends environmentalists into a tizzy. It’s also the most rapidly growing fuel source in the world, it’s broadly distributed with almost 70 countries having economically recoverable resources, and the energy found in it still exceeds that in all other fossil fuels combined. As far as energy prices go, coal has historically been lower and less volatile than oil and gas. For developing nations, this makes coal a first pick as an energy source, and combined with considerable deposits, it is simply the cheapest and most convenient thing around. This isn’t to say it’s not important for the rest of the world: in the United States, almost 50% of all electricity generated and 90% of the steel production is fired by coal. 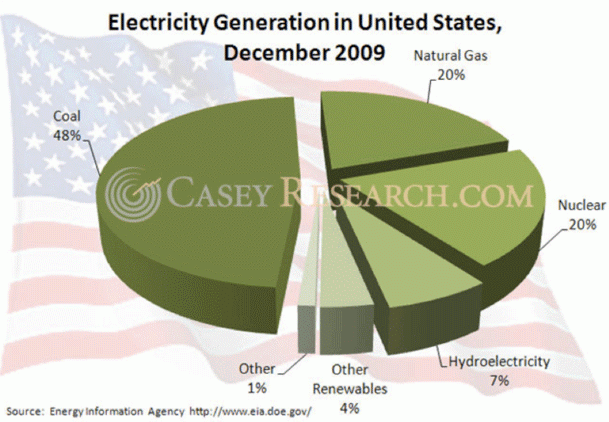 The King’s Coal – Better Than Gold? India is seeing rising demand even as coal resources shrink, while China consumes almost half of the world’s production of coal each year. With a rapidly expanding industrial sector that needs constant fueling, and cleaner alternatives still too expensive, China and India are out shopping… and undeveloped coal resources from Mozambique to Canada are the hot items. Which makes the companies holding on to these assets prime targets for takeovers and joint ventures. Then there is metallurgical coal. Known more widely as coking coal, it is essential in refining iron ore and the production of steel, and carries none of the environmental stigma that comes with thermal coal. Nor is it as abundant as thermal coal – only a relatively narrow range of coal rank and compositions make good coking coals – and thus demands a much higher price. Any industrialized nation has a high demand for steel, and with housing booms and rapid infrastructure development, Japan, China, India, and Korea (to name a few countries) are desperate seeking to fuel their growing appetite. With the demand for thermal and coking coals becoming red-hot in the strong Asian markets, the team at Casey’s Energy Report knows coal is the invisible bull market. 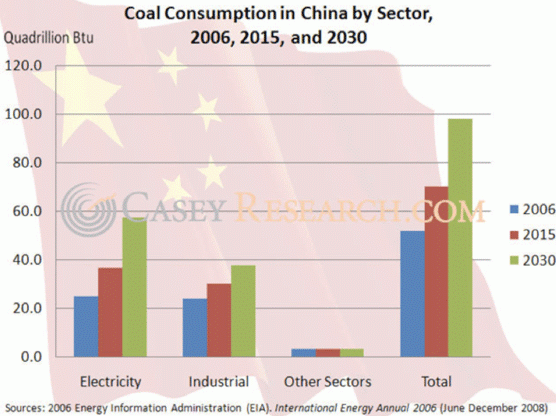 In 2009, China’s total coal imports tripled, reaching 125 million tonnes, and last month it signed yet another multi-billion coal supply contract. India’s growing negative coal balance saw a record-breaking 80 million tonnes of coal imported last year – and that number is set to rise for 2010. The global energy market is set, and the profits are there for the taking. Casey’s Energy Report has been watching this sector for over two years now, and our subscribers have benefited from a 38% spike in the price of coal in a single day. We know which junior companies combine excellent cash flow with knowledgeable management teams to use an investor’s money best to advance projects. Click here for a risk-free trial subscription.